This baby quilt was made using a MSQC Xs and Os Quilt pattern except I made it baby-sized for our niece’s new baby girl due this June. 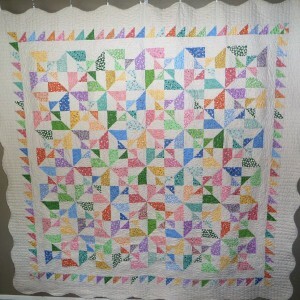 I used 10” precut squares, from the Romance Mint Collection by Benartex, and adjusted the pattern for a small quilt. I tried to be a little creative on the back by centering three large pinwheels. I also used leftover pieces of my 10” squares to make the binding. 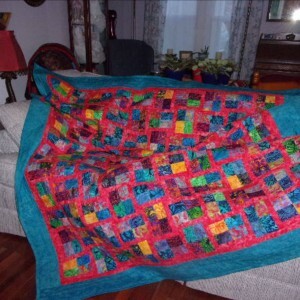 This was my first attempt at machine quilting, something I hope to try again soon......maybe! I started my Sundrops (by Corey Yoder, for Moda) in the Magic Diamonds pattern so long ago! 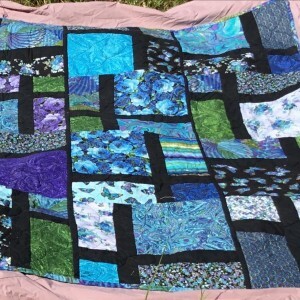 I worked on the individual squares on and off for about 3 years now, putting them away, making another quilt, then taking them out again. I "finally" finished this project. 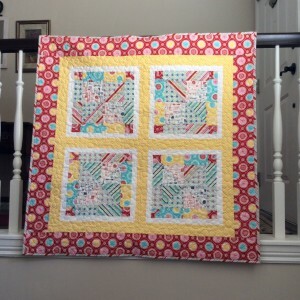 Since I did not have enough squares to make at least a twin size quilt, I went with a table topper. The backing and the binding is done in the strawberry print from the collection. I did a simple loop pattern for the quilting. It looks great with my "fall silk flower" arrangement. I have to update my silk flowers suitable for summer! Made for my son with the leftover pieces of flannel from his winter pajamas. 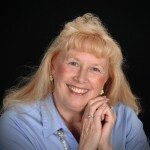 The fabric line is Happiness Is Handmade by Lori Whitlock for Riley Blake. I’ve never tried this 9 patch wack n stack pattern before but turned out real cute. I had to double sash to get the minimum size I needed. 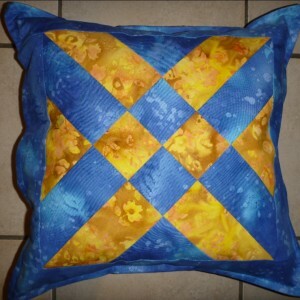 I used a bright yellow Minky for the backing and a cute daisy quilting pattern. I used the rest of the left overs to make two burp cloths from leftover flannel. This too is for one of the young moms at church. 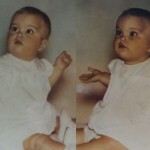 I just added a darling picture of baby Bridget on her quilt. 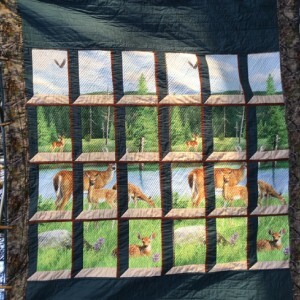 used two panels as I wanted it larger, quilting windows 1/4” apart diagonally, my husband likes heavy quilting . I think it looks like sun rays . Then quilted stitch in the ditch on window frame. Quilting was done row by row then connected together . 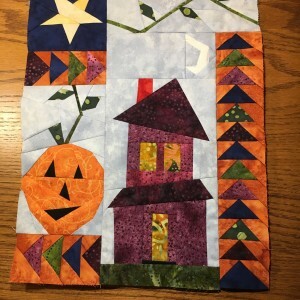 I paper pieced this panel from a kit to sell at our quilt show boutique. 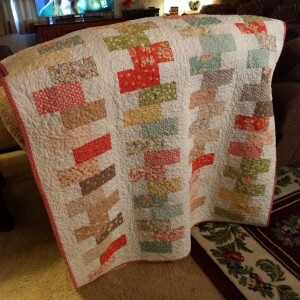 Another guild member quilted it. I had not done much paper piecing so it was good practice. i think it is very cute. 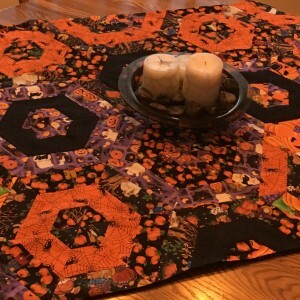 I had created a jelly roll with my Halloween fabric remnants. 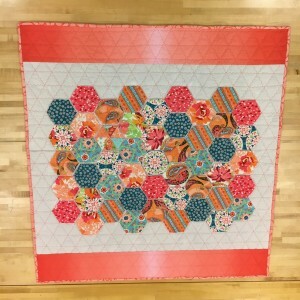 I decided to try this Hexagon Garden pattern with that jelly roll. 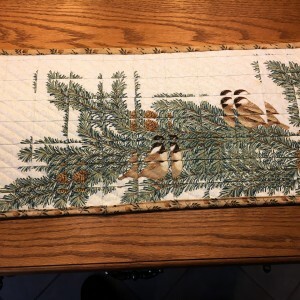 I decided to use it as a wide table runner. It adds a Halloween punch to my breakfast table. Matching up the strip set with nested seams was a construction concern as I changed the layout of the wedges. Another learning opportunity. After a presentation on fracture quilts at a guild meeting, I tried this art piece, barely larger than a place mat. It starts with four identical panels which are cut precisely. There are lots of seams, and I found it important to get it done without time lapses to avoid moving strip positions incorrectly. It also required spreading out in extra space during construction. The prism effect is one that I like. Our guild was challenged to do a block of the month in 2018. I was able to use some fabric I had in my stash and loved. I was short on some fabric, though, so I looked for a creative way to tie the blocks together for the quilt top. 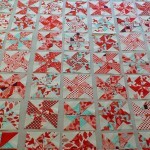 My love of stars, an ample amount of the cherry red, and a similar design in a quilt book yielded this design. My friend long-armed it for me in time to give to my mother for Valentine’s Day. I tried some English paper piecing. This pattern was purchased at a guild meeting and altered to fit my needs. 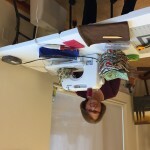 Machine quilting rather than hand piecing. I decided to use some charm squares that had been patiently waiting in a basket and went shopping for a solid ombré fabric at my local quilt shop. It was a fun, quick project and the first to be completed in 2019! 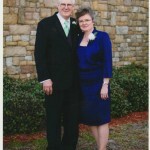 Lots of prayers went into this quilt, Gracie was diagnosed with brain lesions in her frontal cortex. She's an adorable 16 year old, that just bought her first prom dress when she started having seizures. Now that they know what's wrong, here's hoping there's cure in her future. 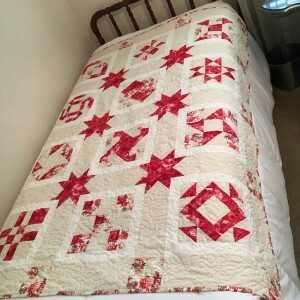 It's a Missouri Star pattern, Phoebe's Flower Box in Artisan Batiks, Totally Tropical, the coral- is a Rhubarb batik, The backing is inspirational messages.